Indian police forces first appeared on the Great Plains during the 1830s, when the federal government relocated eastern tribes such as the Cherokees to Indian Territory. Known as the Lighthorse, Cherokee police units performed law enforcement duties similar to their European American counterparts of the period. During the 1860s and 1870s Indian agents throughout the American West began to organize police forces to protect reservations from cattle and horse rustlers, timber thieves, and liquor peddlers. In 1862, for example, the Bureau of Indian Affairs (BIA) agent at the Pawnee Agency in Nebraska created a police force to curb horse thefts. Agents at Red Cloud and Spotted Tail Agencies in northwestern Nebraska created similar forces during the 1870s. These police forces operated autonomously, without federal approval or funding. This changed in 1878, when Congress legitimized Indian police forces by providing funds and operational guidelines. BIA agents quickly organized Native police forces, in part because this increased their influence over reservation affairs and removed the need for military troops. By the end of 1878 police forces operated at twenty-two agencies. Three years later forty-nine of sixty-eight agencies had police forces, and by 1890 the number had risen to fifty-nine. Indian policemen are often viewed unfavorably by historians. Using examples such as the 1890 killing of Sitting Bull by Standing Rock policemen or the role of BIA police officers at Wounded Knee in 1973, many scholars have portrayed Indian policemen as traitors to their own people. This interpretation fails to acknowledge the origins of police forces. The concept of tribal police forces was not new to Plains Indians. All tribes traditionally had law enforcers. Traditional Lakota law enforcers, known as akicitas, enforced tribal laws and customs, policed camp moves, and regulated buffalo hunts. When the first agency police force was organized at Pine Ridge (presentday South Dakota) in 1879, it was the akicitas who filled its ranks, suggesting that the Lakotas may have used this institution to continue their traditional roles. Indian policemen performed an array of duties. Day-to-day tasks included maintaining law and order in and around the agency, including guarding agency property and storehouses, arresting drunks and gamblers, maintaining the agency jail, and serving as messengers and scouts. Armed and mounted policemen also patrolled reservation boundaries, driving off or arresting stock thieves, liquor peddlers, and timber thieves. More controversial duties sometimes included forcing children to attend agency schools and enforcing bans on polygamy, dancing, and traditional ceremonies. In carrying out their duties Indian policemen were often put in danger. Between 1876 and 1906 at least twenty-four Indian police officers were killed in Indian Territory alone. In the deadliest day for Indian policemen, six members of Standing Rock's Indian police force were killed on December 15, 1890, while attempting to arrest Sitting Bull. Early Indian police forces were usually poorly equipped. With little federal support, agents were left on their own to arm and clothe their police officers. Agents at Rosebud and Pine Ridge Agencies, for example, armed their forces with borrowed weapons from nearby Fort Robinson. By the mid-1880s, however, the Department of the Interior was providing standardized uniforms, badges, and weaponry. Dismally low remuneration was another problem. Ranking officers in 1880 earned only $8 a month, while enlisted men received a paltry $5 for a month's labor. Even as late as 1927 many Lakota policemen had to supplement their income by farming. Most forces experienced high turnover rates, because policemen could earn more money as military scouts or laborers. Each Indian police force looked and operated differently from the others. On Lakota reservations police units operated almost like the military. Pine Ridge's police force regularly drilled under the command of ex-military officers and patrolled reservation boundaries in small mounted squads. Cherokee and Choctaw police officers, however, operated more like a European American constabulary, performing law enforcement tasks as sheriffs and deputies. Police forces also varied in size. Units at Pine Ridge and Rosebud Agencies included the maximum of fifty policemen, while the smaller Cheyenne River Agency had only nine officers on its original force. 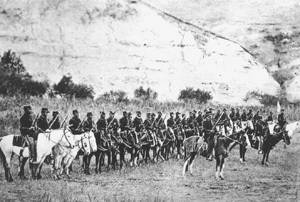 The early 1880s were the heyday for Indian police forces on the Great Plains. During these years Indian police forces performed all law enforcement duties on their reservations and operated largely free of federal control. By the mid-1880s, however, federal laws began to encroach on the autonomy of the criminal justice system on reservations. The Major Crimes Act of 1885 gave the federal government jurisdiction in most felonies, limiting the duties of Indian police officers. The Dawes Act further curtailed the authority of Indian police by placing allottees under the jurisdiction of the state in which they resided. By 1900 the large Indian police forces of the 1880s had disappeared. Without federal financial support, most reservations could employ only one or two police officers by the 1920s; even the largest Lakota reservation employed only seventeen officers. By the 1950s Bureau of Indian Affairs police forces had supplanted most agency forces. In 2000 Bureau of Indian Affairs police forces operated in every Great Plains state except Texas. Ellis, Mark R. "Reservation Akicitas: The Pine Ridge Indian Police, 1879–1885." South Dakota History 29 (1999): 185–210. Hagan, William T. Indian Police and Judges. Lincoln: University of Nebraska Press, 1980.